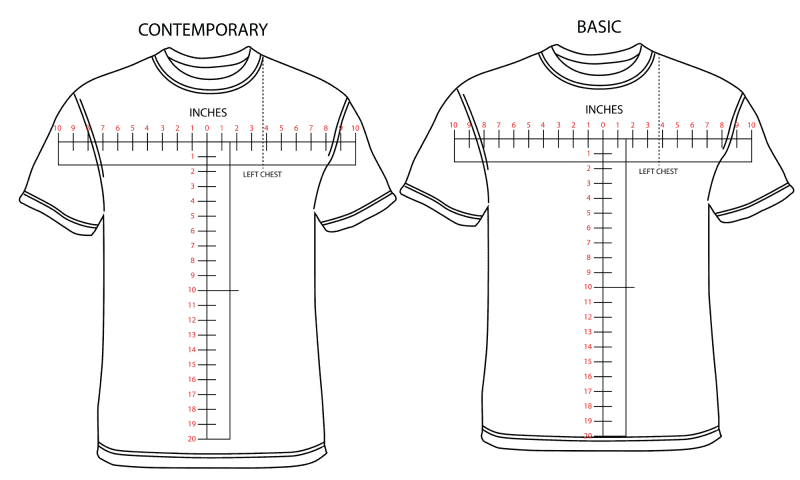 Welcome to sourced garments 101, this post is intended to help you find the right garment for your project. It’s a lot of information to take in; but we hope this empowers you to make the right decision in choosing your garment(s). You’ll find just about anything you’re looking for through our preferred vendor links and the products by category brake down. If not send us a description of what you have in mind and we’ll come back with product links that match your description. In this basic canvass of garment sourcing you’ll find an intro to fabric compatibility, a general fit guide, a list of our top vendors and our leading garment brands by category. Just below here are the page jumps that take you directly to those subjects. Know that we are here to help you so reach out if you have any questions. Here at The Foundry we believe that good embellishments start at the garment. With so many fabric blends on the market it’s a literal arms race between fabric and print technology. In many ways, the attributes that make modern fabrics so comfortable can also make them difficult to print; take moister wicking, water repellency or stain resistance for example. Most fabrics are designed around wear-ability opposed to being suitable substrates for embellishment. We believe that in order to achieve premium print results you have to approach every project in the same order; knowing the fabric material then determining the embellishment system used to decorate it. Humans are shaped differently from one another by many dimensions and everyone has their own definition of a good fitting garment. Knowing this the garment manufactures pull fit specs from a pool and average them to try and get a consensus for dimensions by size for each subcategory. The basic subcategories are age and gender, and within each of those you have either contemporary or basic fit. Congratulations you read that without falling asleep! With that let’s look at the difference between contemporary and basic fit and understand that the following is a generalization. Contemporary fits are slightly longer in the body and trimmer in the overall silhouette. Contemporary garments are typically constructed from finer materials and cost roughly 20% more than their basic companions. Basic fits are slightly shorter in length and have a wider more relaxed overall silhouette. Basics have a heavier more traditional construction as well. These principals apply to all tops whether it’s tees, jackets or hoodies. Both contemporary and basic fits have a healthy market share at our shop, the difference really comes down to end user demographic and value. Now the garment industry is enormous, it’s safe to say that we have access to tens of thousands of garment styles. Navigating all those products can be a real challenge, fortunately there are a handful of distributors that filter a lot of that for us and you’ll find most of the top products on their websites. Pack a lunch and see those links below. As you can see there are a lot of products out there and to assist in your search we’ve broken it out by category/brand below. These are our top selling favorites based on the leading characteristics; quality, availability, fit, embellish-ability (we made that word up) and the logistics to obtaining them. Tultex – A new addition to our recommended product assortment and a favorite amongst the staff. Independent Trading Co – Our #1 fleece line, contemporary and basic fits in great quality fleece. Gildan – A great basic and affordable line of fleece. Beimar – Good contemporary fleece along with some cool technical styles. MV Sport – Some great novelty styles, especially for Ladies. Beimar – Overall our favorite Jacket brand, their modern fit coaches jacket is one of our favs. Dickies – Some very cool basic workwear type jackets. Harriton – Good basic styles in affordable makeups. Flexfit/Yupoong – Something for everyone, our go to for modern caps and knit beanies. Rothco – Our leading supplier for knit caps. They also have helmets and airsoft guns, I’m just saying. Decky – great traditional styles and modern takes. We really like some of their novelty fabrications. Cobra Caps – Good traditional and non structured styles. Liberty Bags – Our leading line of tote bags. That wraps up the general tour of the blank garment world. We’re here to make your project so put us to work, ask us any question and we’ll either know the answer of we’ll figure it out together. Below are some relevant links around the site if you wish to continue your research. You can also find a lot of useful information about general compatibility and shop offered services on the Prints Works page.